It is an exciting time to live in the Olympic Village. Yes,that really is what the tourism and Olympic Movement people call Lake Placid. As my regular readers know, we Adirondackers are proud of the claim "12 full-time residents" will compete in this year's Olympic Winter Games. The place is buzzing with Olympic fervor. If you won't be attending the Games in Vancouver but still want to get in on the action, Lake Placid is the place for you this weekend! In honor of the Olympics, Lake Placid will light the torch from 1980 Games in a ceremony scheduled for this Saturday, February 13 at 5:50 p.m. There will be a torch run, a parade, and speeches, all designed to get everyone fired up for watching the in-depth personal interest stories about the potty training habits of the American athletes on television. Rather, I mean watch the "live" television coverage from here in the United States. However, if you are interested in the Olympics and winter sports, you could also come up here and actually participate in a winter sport, and watch excellent coverage of the competitive events on Canadian Television. 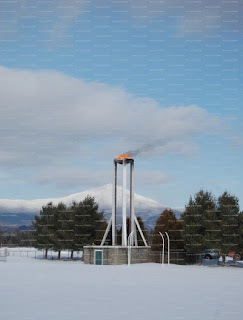 Lake Placid Olympic Cauldron Photo Courtesy of Joe Leonard.